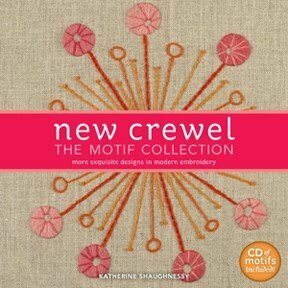 New Crewel: The Motif Collection is Katherine Shaughnessy's latest book. In this follow-up to her best-selling book, The New Crewel, Katherine offers a contemporary collection of motifs and a color palette that will have you reaching for linen, needles and thread. She starts by demonstrating the essential stitches and then gives you 30 modern, fun, and colorful designs -- each accompanied by easy-to-follow instructions and all the necessary diagrams -- several gorgeous projects that showcase the designs, and a CD so you can size the motifs to your liking. Both books are suitable for the beginner or advanced embroiderer.